Showing results for tags 'carbon buildup'. Hello Everyone After a few months of research and practical tests, I'm happy to announce that I found the chemical solution to remove Intake carbon deposits on Direct Injection engines. Im pretty sure many of you already knew this, but as I researched the topic, I didn't find any widespread info detailing what im presenting in this video. I had been using CRC GDI Intake Valve Cleaner for some time, and have had very good results, but I haven't found it in part stores anymore (I Live in Mexico), so this pushed me to investigate what the active ingredient on that product is: PolyEtherAmines (PEAs for short). I also found that you can find PEAs and similar carbon murdering detergents in most Fuel Injector Cleaner Additives. ** Its important to note that using a gasoline additive won't help in Direct Injection Engines, since the injector is inside of the cylinder/chamber ** So I got the idea of using Fuel Injector Cleaner Directly into the intake of the engine, like if it was seafoam, to get the PEAs directly to the carbon in the intake Runners and Valves. 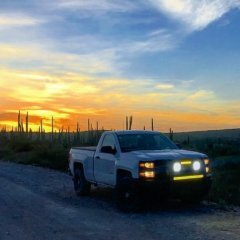 I have been using this method to clean the engine in my 2015 Silverado, which is a GDI L83 Gen V 5.3, and have retained the Fuel Economy and Performance like the truck was new. Im also running a Crankcase Scavenging System to vent all the PCV gasses to the exhaust to avoid any source of Carbon Soot going my intake, but that's a story for another day. Ill leave a more detailed TL:DR version in the video below. If you find it to be helpful please give It a big thumbs up and share. I greatly appreciate subscriptions to my YouTube Channel !